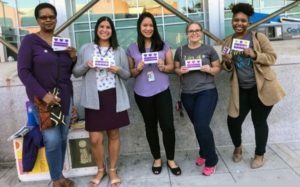 Safe Shores Prevention Team members to participate in Paint the Town Purple, hosted by DC Coalition Against Domestic Violence. DC Council’s presents DC’s DVAM proclamation. We’ll be there. House of Ruth Open House. We’ll be there. Clothesline Project hosted by My Sister’s Place. There, too. Purple Thursday! Staff to rock purple. Our Bilingual Prevention Specialists/Advocates to attend the Latinx March and Vigil.